Yamaha has enjoyed championship-winning success with its YZ250F and a real turnabout in the fortunes of its YZ450F in major product shootouts while at the same time reaping success by introducing new and exciting off-road competition models and championing a full two-stroke motocross line, the only one of the Japanese manufacturers to do so. For 2016, it will be more of the same on all three fronts, as Yamaha celebrates its 60th anniversary as a motor company in style by introducing the 2016 YZ250F and YZ450F with key updates, revised graphics and optional Limited-Edition 60th Anniversary Yamaha color schemes. 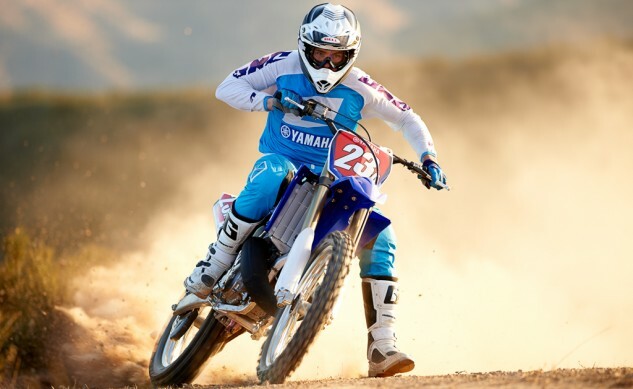 In the two-stroke segment, Yamaha has thrown out a surprise new two-stroke off-road racer, the YZ250X, and it continues to offer no less than three two-stroke motocross models, the YZ85, YZ125 and YZ250. Now, if we could only talk them into building a liquid-cooled 500cc two-stroke, life would be perfect! Having introduced all-new versions of its reverse-incline-motored YZ four-strokes in the past couple years, Yamaha’s plan for 2016 was to refine rather than redesign these championship- and shootout-winning motocross thoroughbreds. Even so, some of the changes made for 2016 are significant. Tops on the list of changes to the YZ250F is a new, lightweight, forged, two-ring piston that features a flat crown surface with additional strengthening ribs, and the piston oil jets that direct oil underneath the new piston to promote cooling, and thus better combustion chamber efficiency, have been revised. A shorter, more durable piston pin with diamond-like carbon (DLC) coating is also new. On the big end, Yamaha engineers have revised the crankshaft and counterbalancer designs to provide a different balance ratio and aid in a more predictive power delivery off the bottom and reduce unwanted engine vibration. To refine the 250F at the opposite end of the rev range, the ECU get new settings that are intended to help eliminate the abrupt feeling generated when the engine hits the rev limiter at stratospheric rpm. Other changes to the YZ250F include a clutch boss and shift-stopper arm as Yamaha continues to refine its clutch engagement feel and shifting action. The YZ250F also gets new brake pad material and a larger 270mm front brake rotor to help improve its stopping power. The fully adjustable KYB speed sensitive damping fork and fully adjustable KYB piggyback shock are the same basic hardware as the 2015 models’, but their settings have been revised to help cushion spike hits and also reduce front-end dive. Yamaha claims that these smoother settings also deliver a more balanced damping feel in corners. The big news for the YZ450F is that Yamaha has entered the launch control sweepstakes with an all-new Launch Control System (LCS) that utilizes high-precision ECU calculations to optimize power output and provide optimum traction and acceleration as the ride leaves the starting gate, especially in hard or slick conditions. The YZ450F also gets new intake- and exhaust-cam profiles and timing to help increase combustion efficiency and make it a little less hairy on the low-to-mid rpm range. 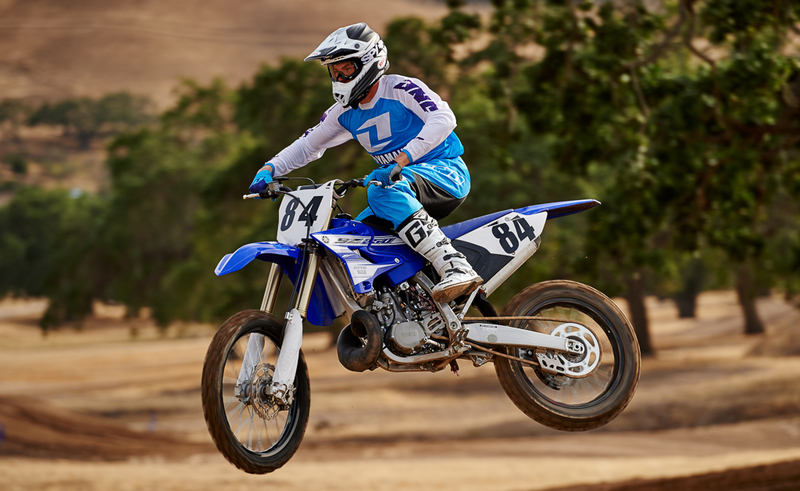 The YZ450F also receives the improved clutch boss and shift-stopper arm in an effort to provide smoother clutch engagement feel and more precise shifting action. Other changes to the 2016 Yamaha YZ450F include revised engine mounts and a narrower swingarm pivot section on its bilateral beam aluminum frame in an effort to improve lateral rigidity. The footpegs are also mounted 5mm lower to help lower the rider’s center of gravity for improved balance and control. In the suspension department, the YZ450F gets new triple clamps with a 25mm fork offset intended to help improve the YZ450F’s front-end feel, and a softer, 56Nm shock spring replaces the old 56Nm spring to improve bump absorption and aid in better overall handling. Like the YZ250F, the YZ450F also gets the new brake pad material and larger 270mm front brake rotor. 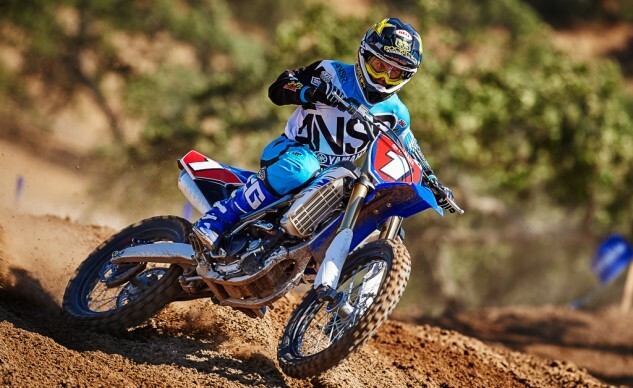 When Yamaha unveiled its all-new 2016 YZ250X two-stroke off-road racer to the American press corps last week at Tom White’s Early Years of Motocross museum in Southern California, it came as a bit of a surprise because it wasn’t the new off-road Yamaha we were expecting. 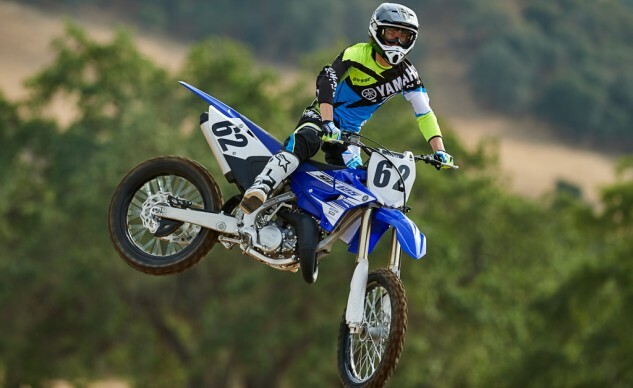 With last year’s YZ250F four-stroke-based YZ250FX cross country machine being such a hit—Yamaha claims that it was the best-selling 250cc four-stroke off-road racer on the market last year—a YZ450F-based version in FX trim seemed to be the logical next step. Even so, the YZ250X may just be the right off-road bike at the right time. In an era of modern, high-revving four-strokes, all-new Japanese two-stroke models are rare indeed, which makes the YZ250X a special breed by that measuring stock alone. Naturally, the X is based on its motocross sister, the YZ250, but it’s more than just YZ with a big fuel jug and softer suspension. Its 249cc liquid-cooled, carbureted, reed-valve-induction, two-stroke engine receives a milder compression ratio than the YZ along with different exhaust port timing, a new CDI model-specific CDI unit and a new Yamaha Power Valve System (YPVS)—all of these items designed expressly for off-road racing and all of them intended to make the YZ’s powerband wide and controllable. 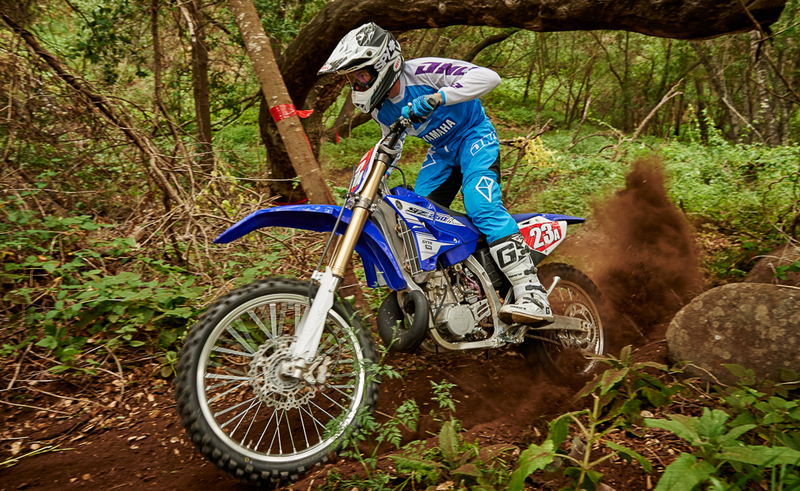 The X model’s 249cc two-stroke engine is based on the YZ250, but its power valve tuning, ignition and exhaust system are all designed specifically to widen the powerband for off-road racing. For instance, the YPVS features broader opening timing for to make the potent YZ engine smoother and help its low-end grunt. Yamaha claims that the YZ250x delivers that along with potent midrange thrust and a blazing top-end. The X’s compact expansion chamber is also designed specifically for off-road racing. Yamaha engineers made the pipe narrower both horizontally and vertically. But just as with the late, great YZWR, the greatest distinction between the YZ250X and its motocross sister comes in the form of a wide-ratio five-speed transmission that Yamaha claims will offer the rider more effective ratios for use in everything from tight woods sections to wide-open terrain. A new clutch lever has been incorporated to help reduce rider fatigue as well. 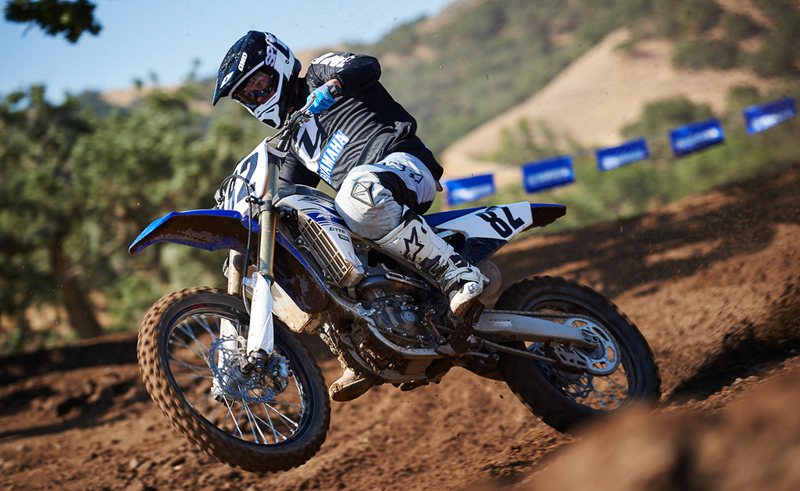 Like the YZ, the X’s “works-style” lever features a barrel adjuster for easy on-the-fly adjustments to clutch play. 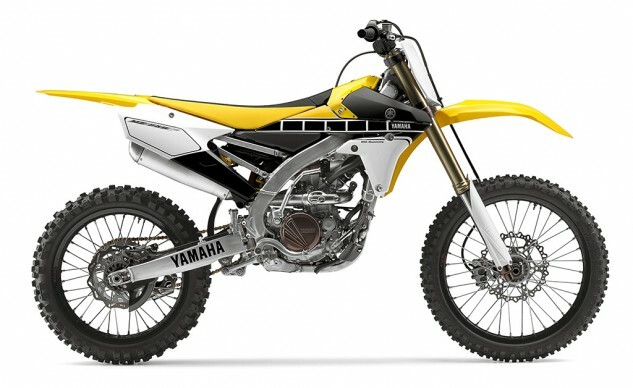 While we would love to have learned that Yamaha has stepped up to fuel-injection with the YZ250X, no such luck. It still uses a good old-fashioned carburetor. While the Yamaha’s 38mm Keihin PWK carburetor may be old school, it has a solid reputation for working well, and it benefits from at least some fairly recent technology in the form of a throttle position sensor designed to provide precise fuel/air mixing and crisp throttle response throughout the rev range. Downstream of the carburetor is a two-stroke staple, a reed cage fitted with carbon fiber reed-valve petals to improve throttle response and engine performance at across the powerband. 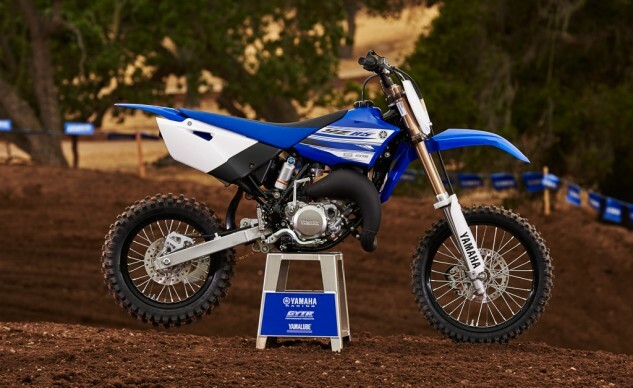 The X also makes use of the YZ250’s cooling system, which features large-capacity radiators with ten-row cores and four louvers for optimum cooling efficiency. Great, how about an electric fan to all but guarantee that the X doesn’t bubble over in tight, slow and hot conditions? The X doesn’t have one. The YZ250’s quick-handling and uber-stable backbone-style aluminum chassis and subframe cradles the X motor, but the X’s fully adjustable KYB® spring-type fork with speed-sensitive damping fully adjustable KYB shock are valved for the demands of cross-country racing rather than motocross. 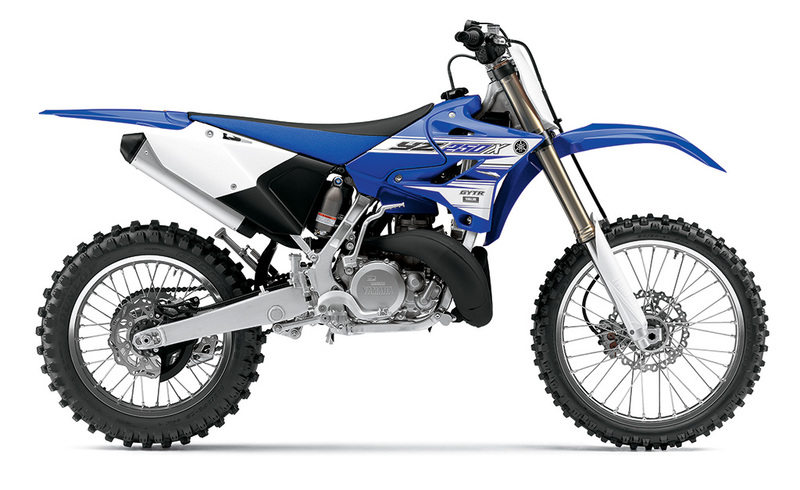 The YZ250X’s rolling stock is also different, featuring an 18-inch Excel rear rim instead of the 19-incher found on the motocross bike. Off-road racers prefer the 18-inch rear wheel because it allows for more tire sidewall, which flexes to offer better traction in soft terrain and in rocks, and it also adds a measure of protection against flat tires when rocks or roots are hit at higher speeds. Dunlop’s excellent Geomax AT81 off-road tires are mounted on the rims. Additional cross-country specific features on the YZ250X include a standard side stand, a sealed O-ring chain and, maybe the most important small detail of all, a reserve fuel petcock to help keep the rider from running completely out of fuel while on the course. The 2016 YZ85, YZ125, and YZ250 will each be available in Team Yamaha Blue/White. MSRP for is $4090 for the YZ85, $6390 for the YZ125 and $7290 for the YZ250. All three bikes will be available in dealerships beginning in late August. Wet Weight (claimed) 231 lbs. Wet Weight (claimed) 247 lbs. Wet Weight (claimed) 229 lbs. Get price quotes for Yamaha from local motorcycle dealers.